Oh, me oh my! 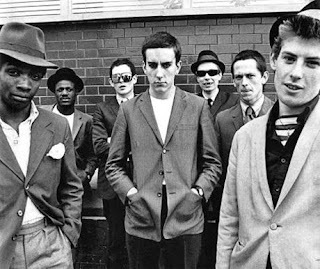 I am so excited today because my of my best friends got me a ticket to see The Specials live in concert in NYC!!! SKA was the beginning to many of my romances with music, people, and my home of 10 yrs New York City. Before I moved to the city I lived in CT where I would sneak off to SKA shows in New Haven, University of Hartford, upstate NY, New York City, and Pearl Street in Northampton. I was a big fan of local CT bands like Nigel Six and Johnny Too Bad and the Strikeouts. I remember dressing up in wing tip shoes or docs, tight pants, Fred Perry shirts, and maybe a paperboy hat to top it off. Back then, I had fire engine red hair cut in little bob with babydoll bangs! My favorite NYC SKA band at the time was Metro Stylee...I prolly listened to their demo tape hundreds of times driving around in my car during High School. Oh SKA how I love you...I've never forgotten and never will.